So many girls love fashion, express their style via social network websites and even run their own blog. I'm obviously one of those many girls who shares her admiration for fashion & style through this blog. Not everyone runs a blog or constantly posts outfit pictures online, but perhaps some may want to but just can't for whatever reason? Here is your chance to share your personal style with the virtual world! I've been doing Style Spied for Aquila Style for some time now and have had a chance to communicate with lovely girls from all over the world. Now it's your turn to shine and show your unique style. 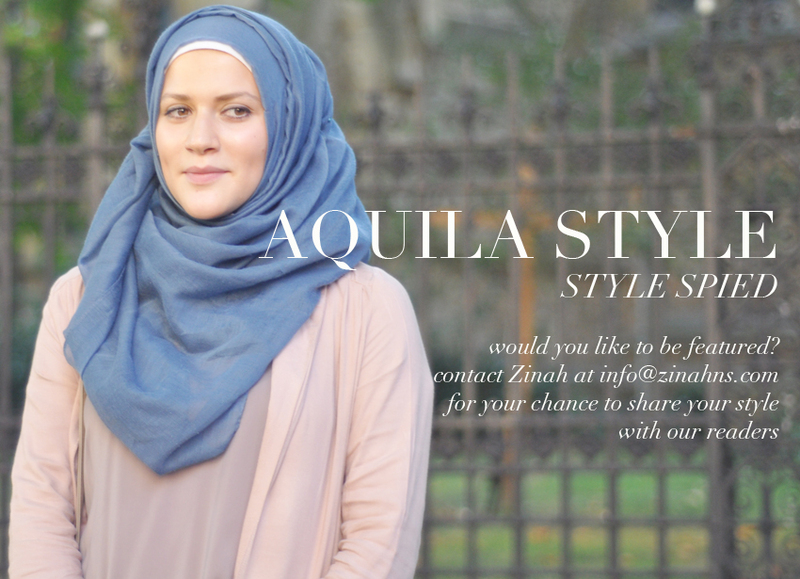 Would you like to share your personal style with the Aquila Style readers? For a chance to have a short Style Spied feature on Aquila Style website, submit 6-10 images with descriptive captions and a brief bio for consideration to info@zinahns.com with the subject 'Style Spied'. Every women of all ages (18+), backgrounds, hijabis or not are all welcomed to submit their personal style.Here is an example of Style Spied feature I look forward to hearing from you. This entry was posted in Blog,Street Style. Bookmark the permalink.